Wild Birds Unlimited: Treat your birds with a cranberry seed cake! 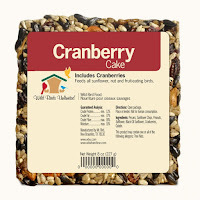 Treat your birds with a cranberry seed cake! When cold weather hits many bug eating birds have to switch their diet from bugs to fruit nuts and berries. 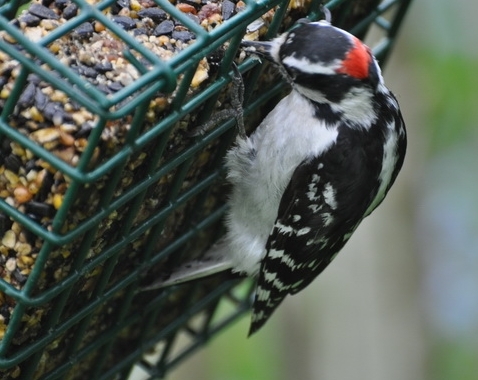 Wild Birds Unlimited cranberry seed cakes, like suet cakes, attract many seed, fruit & nut-eating birds such as woodpeckers, chickadees, titmice, nuthatches, wrens & more. The birds stay longer eating at the feeder instead of grabbing a morsel and flying quickly away to eat it elsewhere. The cakes are packed with high-calorie nuts to provide birds with enough energy stay warm. The ingredients, pecans, sunflower chips, peanuts, safflower, black oil sunflower, and cranberries are bound together safely and compactly with gelatin. Measures 4-3/8" x 4-3/8" x 1-1/4" thick. Fits any single-cake suet feeder. I love all the blogs I read as siin as I have time to read them. I have MS and that takes a lot of my time. I also try to pt in Ur photos on my "bird" and tell them to go and read Ur blog to learn sooo many new things about the birds and what to do to help them and what to fead them with and U really good birdfeaer U have and sale to them and what they also can get knowlige about other , both small and big animals in their garden. Love what U write, allways when I have time to be here. Keep up U very good work U do, since U are needed for so many bird lovers. Hugs Evamaritha on Pinterest where I also follow U.